Meal planning is supposed to make our lives easier, right? Well, between the planning, preparation, and finally, the actual cooking of your meals, it doesn’t seem that it gives you much of a break. 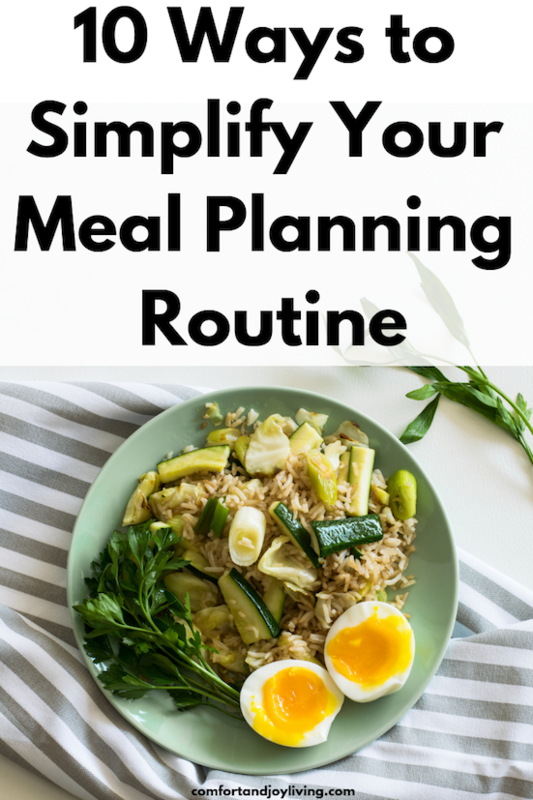 After meal planning for my family for a few years now, I’ve come up with some tips that will simplify your routine. Most quick and simple meals consist of a vegetable, a protein and a starch. This can be a healthy meal of chicken strips and sautéed broccoli on a bed of wild rice. Choose meals that can be prepared in one pot. I have an instant pot that dramatically shortens the cooking time. Some of my favorite go-to one pot meals are chicken and pasta, chicken and rice skillet, stir fry dishes, stews and soups. I would love to make more food from scratch, like soups and tomato sauce using the freshest ingredients, but my schedule just doesn’t allow me to. Keep it simple and convenient by buying jarred and canned products. Do you want to know the secret to jazz up simple meals? Use only the best, most flavorful ingredients! Use fresh herbs, strong Parmesan cheese, or a squeeze of lemon or lime can make basic meals feel so much fancier. Grow herbs in a container or vegetable garden, then use them to add a little oomph to your dishes. Plain ol’ pork chops and rice can become a special meal when you have fresh thyme or rosemary. I love getting a lot during the weekends to free up some time for the hectic weekdays. Doing prep work beforehand saves me lot of time and it’s quite a relief knowing most of the work is done. If there are leftovers from dinner, serve it the next day in another simple recipe. For instance, if, there’s enough leftover chicken, I’ll make chicken salad sandwiches for lunch or dinner the next day. We have Make Your Own Pizzas on Friday nights, where I’ll heat up pre-made pizza dough, add the sauce and put out some toppings so the kids can make their own pizzas. You can also do this with sandwich subs and tacos. Having a pantry full of rice, pasta and beans and other legumes. Items like these are so easy to prepare and all you have to do is just add some veggies and chicken and you have a full meal. Similar to prepping meals, you can make enough meals for a whole week to a whole month if you have the freezer space. For really hectic weeks, I will make enough casseroles and soups that I can just take out of the freezer and heat up. There are days when my kids give me a look that says “That again?” when I tell them what we’re having for dinner. Sometimes, my first instinct is to immediately go on Pinterest to find a more interesting recipe to make. But at the end of a weekday, it’s just not feasible to experiment with something new. Try the new ideas for when you have more time and keep it simple for your busier days.